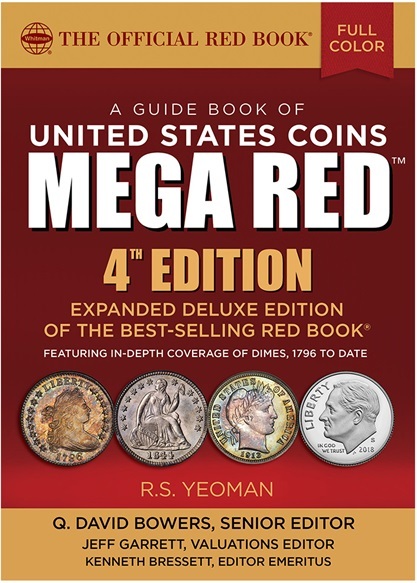 (Pelham, Alabama) — The fourth edition of MEGA RED (the Deluxe Edition of the Guide Book of United States Coins) features an expanded coin-by-coin study of U.S. dimes—294 pages covering 845 varieties from 1796 to date. Its focus on dimes also includes 15 new appendices on different aspects of the coins. The 1,504-page MEGA RED is available from booksellers and hobby shops nationwide, as well as online (including at the publisher’s web site, Whitman.com). It retails for $49.95. Whitman Publishing numismatic director Q. David Bowers, who serves as senior editor of MEGA RED, wrote the expanded feature and contributed to all of the related appendices. “United States dimes are extremely popular among collectors,” he said, “offering areas of specialization to accommodate almost any budget and level of interest.” He notes that MEGA RED presents the most comprehensive coverage of early dimes (the Draped Bust and Capped Bust types) ever made in a general-interest book. The John Reich Collectors Society, whose focus is on early U.S. silver and gold coins, was a useful resource for pre-1838 dimes. “Back issues of their John Reich Journal are a goldmine of information and can make everyone an expert,” Bowers said. He called special attention to Barry Sunshine, a dedicated specialist of early dimes, who shared research and observations from longtime study. More than 50 pages are dedicated to Draped Bust (1796–1807) and Capped Bust (1809–1837) dimes. This includes nearly 300 photographs (including enlarged photos of every date, plus many die varieties); mintages; commentary on the market, collecting tips, physical characteristics, and other notes specific to each coin; certified population data (number certified, average grade, and percent in Mint State); and values in grades from About Good to multiple levels of Mint State. Bowers also provides grading instructions (with high-quality enlarged photos of coins in grades from AG to MS, plus Proofs), history and background on each coin type, biographies of their designers and engravers, and guides to collecting. Bowers’s coverage of Liberty Seated dimes (1837–1891) is similarly detailed over the course of 90 pages, and illustrated by 457 large-sized photographs of this long-running series’ coins, plus historical images. Bowers spent many hours studying the availability of each coin in various grades. He gives a great amount of advice and guidance on smart buying and collecting, and shares insight and research from the Liberty Seated Collectors Club and other specialists. For Barber dimes (1892–1916) Bowers presents another full guide to collecting, grading, history, surviving populations in circulated, Mint State, and Proof formats, die varieties, hub changes, strike sharpness, and other factors relevant to collectors. He consulted with John Frost, Phil Carrigan, and other members of the Barber Coin Collectors Society for research into each date and mint. Certification data and retail price charts show the market for coins from Good-4 up to Mint State–65, plus Proofs at multiple levels. Barber dimes comprise 42 pages of research and 241 photographs, including close-ups of die-variety diagnostics. Winged Liberty (or “Mercury”) dimes of 1916 to 1945 make up 40 pages of the expanded catalog. Bowers explains the changeover from Barber coins to the new design, including patterns, release and distribution, and the public’s perception. His coverage of strike characteristics, Proof Mercury dimes, grading standards (including for Full Band details), retail prices in 12 grades, population data, die varieties, marketplace factors, and other details give collectors plenty to study. Bowers consulted with David W. Lange, Bill Fivaz, and other specialists for in-depth research. The coin-by-coin study is illustrated by 123 photographs, including many die-variety enlargements. For Roosevelt dimes, Bowers lays out the history of the coin developed to honor President Franklin Roosevelt, who led the nation out of the Great Depression and through most of World War II, dying of a cerebral hemorrhage just weeks before Germany and Japan surrendered. Bowers gives an illustrated biography of Roosevelt, a history of the coin’s design (including the controversy over artist Selma Burke’s claim to be its designer), and information about production, hub changes over the years, tips for collecting, and grading standards (including for Full Torch details). His coin-by-coin study covers silver Roosevelt dimes of 1946 to 1964, including Proofs, plus the mysterious 1964 Special Mint Set coins. He discusses 1965–1967 SMS coins, and popular die varieties listed in the Cherrypickers’ Guide. Copper-nickel and silver Roosevelt dimes of 1965 to date are explored in charts and photographs of each. In total, 67 pages and 575 photographs are devoted to these popular modern coins. In addition to these detailed studies of individual dimes, of MEGA RED’s 25 appendices Bowers coordinated 15 that each focus on a specific dime-related topic. The richly illustrated “Carpe Dime! Dimes Seize the American Imagination,” by award-winning numismatic author Joel Orosz, explores dimes in popular culture ranging from music to literature, movies and other entertainment, commerce, banking, and other aspects of life in the United States. Other appendices show extraordinary error and misstruck dimes; pattern dimes and proposals that never became official coins; counterstamped dimes; dime scrip issued by banks, merchants, and towns; “paper dimes” from the U.S. Treasury Department; Civil War sutlers’ “dime” tokens; Civil War ten-cent store cards and dimes used as planchets for silver Civil War tokens; dimes recently discovered in the purser’s safe of the shipwreck SS Central America; the history of the famous 1894-S dime; a snapshot of the dime market in the 1940s; irradiated dimes; and an illustrated essay on the greatest U.S. dimes. “With more than 1,600 high-quality photographs of U.S. dimes, this edition of MEGA RED is like having six beautiful coin collections laid out in front of you for in-depth study,” said Bowers. “Add to that 80 pages of related appendices with an additional 250-plus photographs, and you cannot afford to miss out on this edition.” Images are from the Whitman Publishing historical archives plus coins photographed by Heritage Auctions, Stack’s Bowers Galleries, NGC and PCGS, the Smithsonian, and individual hobbyists who answered Whitman’s call for dime photographs.